In this post I wish to go into more detail about one of the reasons it is important to take control of your autofocus system, namely not allowing the locations of the AF Points in your viewfinder to dictate your final composition. As I mentioned in previous autofocus posts, one of the essential steps in taking a successful photo is controlling where the camera focuses. If you allow the camera to auto focus by choosing its own focus point(s), it typically focuses on the closest object. This may or may not be what you want to focus on, so you should select where the camera focuses using the Auto Focus Points. For example, you often want to focus on a subject’s eyes, but if you allow the camera to choose the autofocus point itself, it may select another part of the face, or somewhere else on the body, or even a raised hand that is nearer to the camera than the face to focus most sharply on. In addition, there are reasons to use the outer focus points and not just focusing with the center AF point and then recomposing. First, if you are taking several shots of the same subject and framing, you will not have to re-focus with the center point and recompose between each shot. And by controlling exactly where you focus, you then have greater, more precise control over the use of dramatic depth of field. Also, if you use the center point and recompose, you have swept the camera in an arc to recompose, and are thus always focusing at a distance behind the subject. This may not be as noticeable when the subject is further away, but for a close subject – especially when using shallow depth of field – the difference is critical. One of the additional critical reasons to take control of your autofocus system is so that you don’t let the location of the AF Points dictate your composition. What happens when the subject you want to focus on is not located exactly under one of the AF Points? Even with 9 or 19 or more AF Points to choose from, they will not always be located exactly at or near where you need them to be. Recomposing or re-framing your shot is often necessary so that you can capture exactly the image you wish to and not one dictated by the locations of the AF Points as you see them in the viewfinder. Figure 2 – Image is temporarily framed to place the selected AF Point over the woman’s head, Shutter Button is pressed half-way and held to lock focus at that distance, image is recomposed to the desired framing of previous Figure 1, and Shutter Button is fully pressed to capture the image. Figure 1 shows the desired framing and composition of the shot I want to take, but the woman is not located under an AF Point. This composition is desired for me because it captures the entire window along with some space around it, as well as some space in front of the woman for her to “walk into” – but not an excessive amount of space. So I manually select the lower right AF Point (using Single-Point AF Mode), temporarily frame the image to place the selected AF Point over her face or head, press and hold the Shutter Button half-way to lock focus at that distance (Figure 2), and see the Focus Confirmation Light illuminate in the viewfinder. I then recompose back to the final framing I want (Figure 1) and press the Shutter Button fully to take the image. Even though the subject is moving, I do not need the sophisticated tracking of AI Servo (Canon) or Continuous Servo (Nikon) Focus Mode to keep her in focus. I can quickly lock focus using One Shot (Canon) or Single Servo (Nikon) Focus Mode, recompose, and take the image without the camera-to-subject focus distance changing significantly. With the example images above (Figures 1, 2), focusing on the wall would not have been tragic because the distance between the subject and the background is small, and if a medium or narrow aperture such as f/8 or f/16 is used both the wall and the subject may be in acceptable focus. If the background was further away, and/ or a wide aperture such as f/2.8 was used – especially with a telephoto lens, and if the image was enlarged, you would clearly see that the camera focused on the wall and not the woman. Not to mention the fact that the wall is a somewhat consistent area of color and the AF system may have difficulty properly focusing on it. So it is best not to take shortcuts such as focusing on the wall and hoping the subject will also be in focus, because in many other situations you will not have this option. It is best to take the photo properly and to learn and practice the habit of working in the more rigorous manner if you want all your photos to be sharp. If you would like to learn more about the autofocus systems of your Canon or Nikon dSLR camera, as well as learn to use the other features of your camera including metering modes, Aperture and Shutter priority modes, all the menus and Custom Function settings, and more, have a look at my Full Stop e-book camera guides. In addition to explaining the features and settings, the guides clearly explain when and why to use them in order to capture the images you desire. For those with other cameras, check out my Ten Steps to Better dSLR Photography which also discusses taking advantage of any dSLR camera’s autofocus system. Hi, can you explain why the focus is always behind the subject if sweeping the camera in an arc? I thought the whole point of using AF-S and Single point was that it would keep the focus even when recomposing? I am facing this problem when shooting kids soccer games. Even with AF-C and 3D Tracking, I get the background or foreground grass in focus with the players out of focus. Any tips? 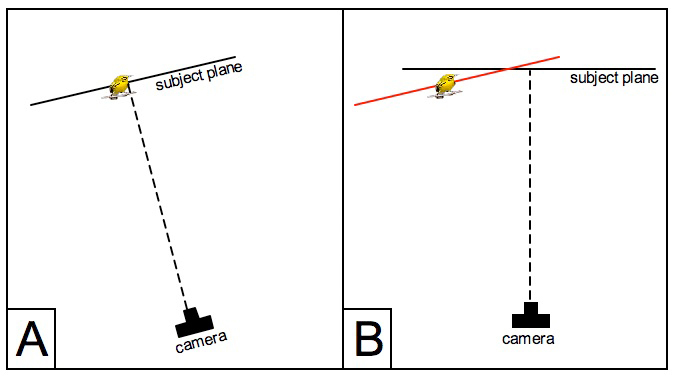 The illustration shows the photographer focusing with the center point and locking focus at that distance, then “sweeping” the camera to place the subject off-center in the image before taking the final shot. You can see that the “subject plane” (original subject distance) that was located on the subject and locked when focusing is now located behind the subject. Yes, the focus stays locked when using AF-S and Single Point, but it is locked at this original distance, and that original distance is now located beyond the subject. In many situations it may be subtle or minor, but with a telephoto lens and a wide aperture, it could be noticeable. If you are using AF-C and 3D tracking, the key is to make sure that you choose the initial AF point where the camera will initially focus / begin tracking the subject, and place that point over your subject, then half-press the shutter button to start tracking. You should see the active AF point(s) in the viewfinder move around with the subject as the subject moves. The camera however may easily lose the subject, and you have to basically start over if you see this happen. 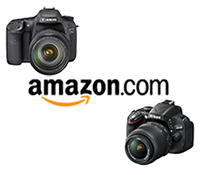 Depending on which camera you have (the D7000 or the D5100?) there may be more Custom Settings that can assist you in keeping the active AF Point on your intended subject. Also, if you take a series of shots, you need to keep the Shutter Button half-pressed between shots in order for the camera to continue tracking the subject. Thanks for the great explanation. I recently bought a D5100 for the purpose of capturing kids soccer games. I read your articles (great read!) but still with a 55-300mm lens, AF-C with 3-D tracking. Almost 40% my pics are getting focused on the grass behind or in front of my kids, and the kids are out of focus. Another 40% of the pics are focused on other players, not my kids (they are in the same team so wear the same color jersey) even though I start the initial focus shutter half pressed on my child. Only 20% of the pics come through with my kids in focus. Not sure if this is a lens or camera or me.